The Marco Bicego aesthetic hints at global influence, often boasting organic shapes and exotic materials set against modern white, yellow, or rose gold. 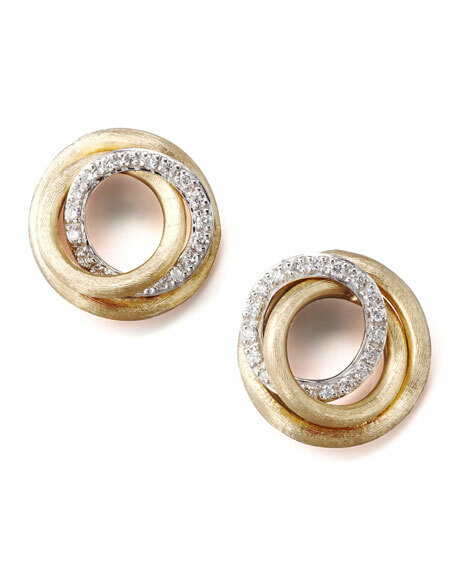 These Jaipur Collection earrings appeal to your sophisticated sartorial sense with seemingly stacked, hand-chiseled yellow gold and glittering, pave white diamond rings. Hand-engraved 18-karat yellow gold interlocking rings form open center. Pave white diamonds set in 18-karat white gold. Diamonds, 0.29 total carat weight.